Stop food cravings and cut chocolate consumption in half by doing this. A 15-minute walk is enough to stop food cravings brought on by stressful situations, a new study finds. The research should help the 97% of women and 68% of men who suffer from food cravings. The study chimes with previous research finding that a 15-minutes walk can stop food cravings for chocolate by half. “We know that snacking on high calorie foods, like chocolate, at work can become a mindless habit and can lead to weight gain over time. We often feel that these snacks give us an energy boost, or help us deal with the stress of our jobs, including boredom. The study involved 47 overweight people with an average age of 28. All regularly ate chocolate or high calories snacks. In the three days before the study, the participants were asked not to snack on any of their usual comfort foods. The idea being that by the time of the study, they would be really craving a snack. In the lab, half the participants spent 15 minutes on a treadmill, while the other half had sat quietly. They then were given a difficult psychological test that made them stressed. This was to cue up their food cravings. They were then given sugary snacks to unwrap, but only ‘handle’. The results showed that those who’d been on the treadmill had much lower food cravings than those who sat quietly. Exercisers also showed lower physiological arousal to handling the sugary snacks. 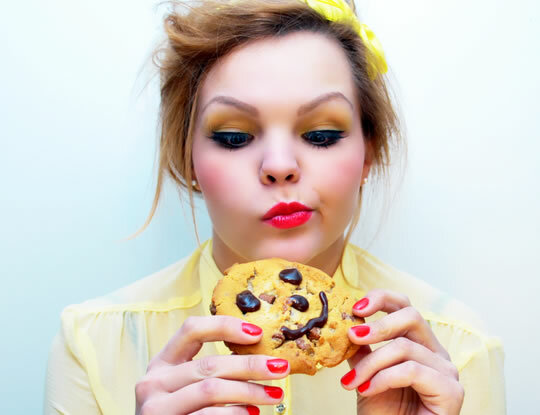 “Short bouts of physical activity may reduce the craving for sugary snacks in overweight people.